"Fresh-tasting. Colorful. Potluck and picnic-worthy." Yummy! I used yellow squash and zucchini added even more color. I only had 2 apples but wish I had all 3. I agree that it needs to marinade at least over night! I loved it! and my husband (the picky one, told me it was awesome!) It is not so sweet, neither dry or oily because of the dressing... the perfect flavour and notes of the green pepper. I didn't include onions and we loved it! My husband couldn't get over how good it was and normally he doesn't comment about anything I make. This recipe is awesome! 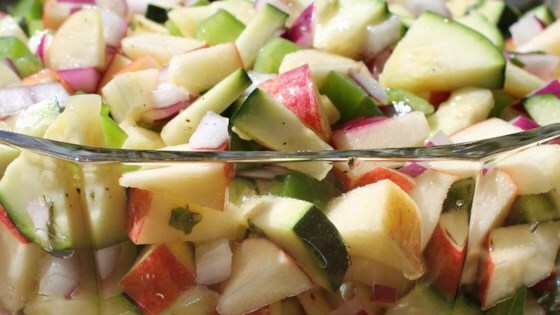 Great for end of summer zucchini harvest when you can't stand any more zucchini bread!